This week is Hunter Week and I have to be honest, I have a bit of a love/hate relationship with the class. I have a lot of Hunters of my own plus Mr Harpy played and raided on one for a couple of years. My Guild Master plays one and so do many of the people I like and admire in-game but I hate meeting them in PvP and my heart sinks slightly when I get thrown into a group activity with one or more of them. I think part of my issue is that I can’t take my own Hunters seriously which sometimes spills over to into other peoples plus I still have flashbacks to being one shot by Mr Harpy’s back in vanilla. Ok he had every buff on known to man at the time and I had less than 4k health with my own buff but it still rankles even now. I really think if Hunters didn’t have pets, I wouldn’t touch them with a barge pole and there in lies the rub. I love running around taming things but really don’t enjoy the shooting bit. 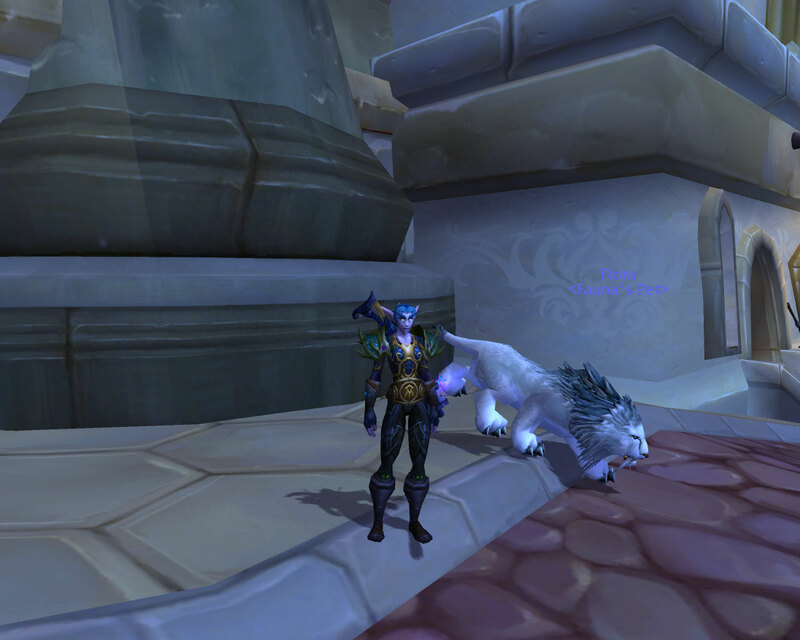 Here is my eldest Hunter with her first proper pet. The one which inspired a story and had me camp in the Barrens on a PvP server as a baby Hunter. For many of my Hunters, I have a been a bit predictable. 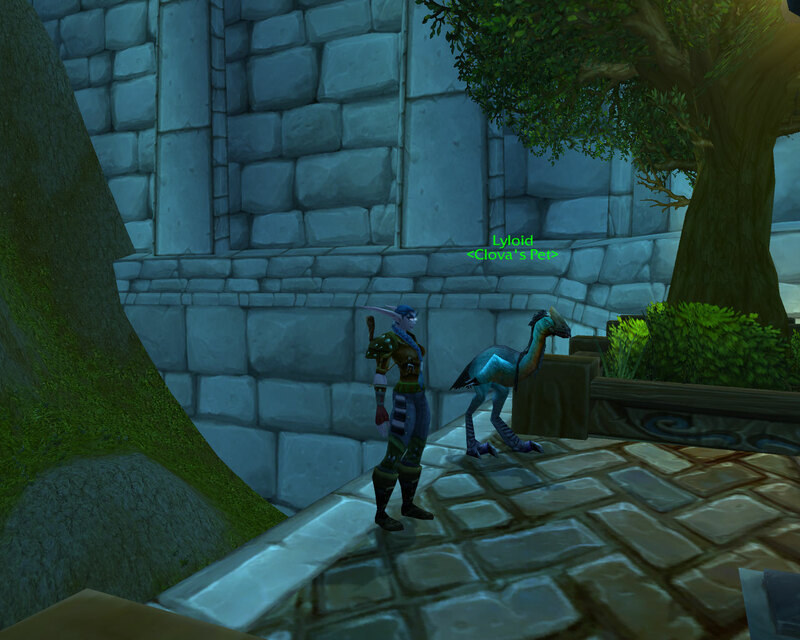 I have far too many Night Elf Hunters littering the European servers, most of them lying there unplayed. I’ve loved this cat model since forever. That’s why I tracked down Humar as a very small Hunter and got killed for the privilege by a Druid who should have known better. I was always envious of a Hunter in our guild who had enlisted the Horde to help him capture this version but at the time I never got a Hunter to a high enough level to acquire one until Wrath. I made Twiceshy just so I could have pets called Oncebitten….. 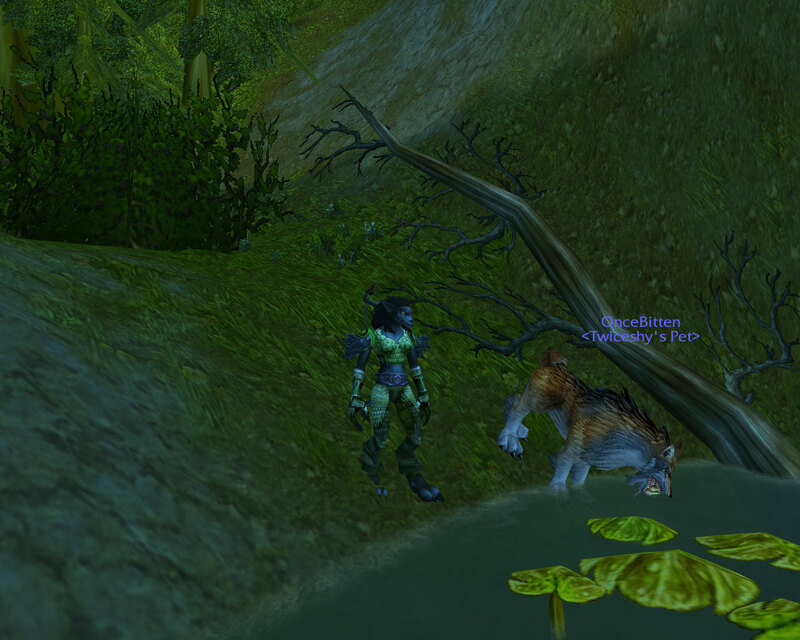 Surprisingly enough despite my professed hate for Worgens, she has grown on me. My latest Hunter, SnowBlossom. Yep, she’s totally stolen Snow Blossom’s name in the hope that some of her awesomeness and coolness will rub off. That’s probably highly unlikely given me and my ability to play Hunters although back the bad old days I did over 2k on Terion Gorefiend by pressing one button on my husband’s!! She also needs to level to tame something other than a turtle. I do have a few more lurking about, including a Goblin called Sproutz whose sole purpose in life is to save Spot however she’s been stuck in Kezan since the start of MoP and a Troll with bright pink hair with a pet called Huggles because who wouldn’t want to be bitten by huggles. Okay, it’s not a rose but a poppy but…. artistic license and all. 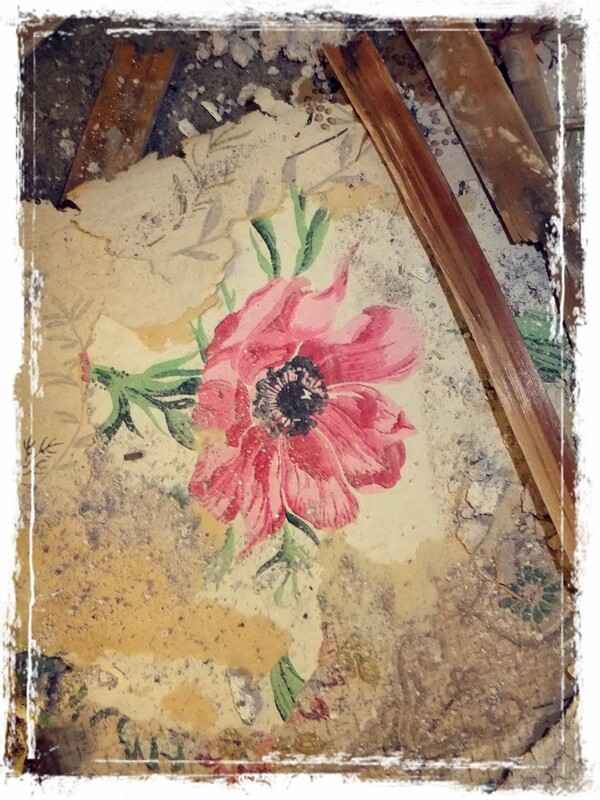 This is actually one of the many layers of wall paper we discovered when stripping the kitchen back to replace it. I’m not a great fan of wallpaper in general but I rather like this one. This post was meant to be many things. It was intended to be my final post of Druid week (yes, my weeks are different to everyone else’s), it could have been my first Hunter post or perhaps I was going to actually do the <A Screenshot A Post> day by day as intended. However the server glitches have brought all those aspirations to a direct halt. My Monk is stuck in the Darkmoon Faire no doubt stuffing her face on fried goods and downing fizzy faire water. My Goblin Hunter is lost in the dark of Kezan and my Worgen was last seen stuck in Stormwind playing cards with a Guard. So given that I can’t post what I want to, I thought instead I’d talk about my aims for Hunter Week. I’ve wanted to save Spot, that poor puppy trapped in Theramore awaiting destruction raining from the skies for a while now but have never managed to level a Horde hunter high enough. This will change though. I’ve dabbled with making my Worgen Hunter a proper transmog multiple times but they’ve never got any further than MogIt. This needs to change. 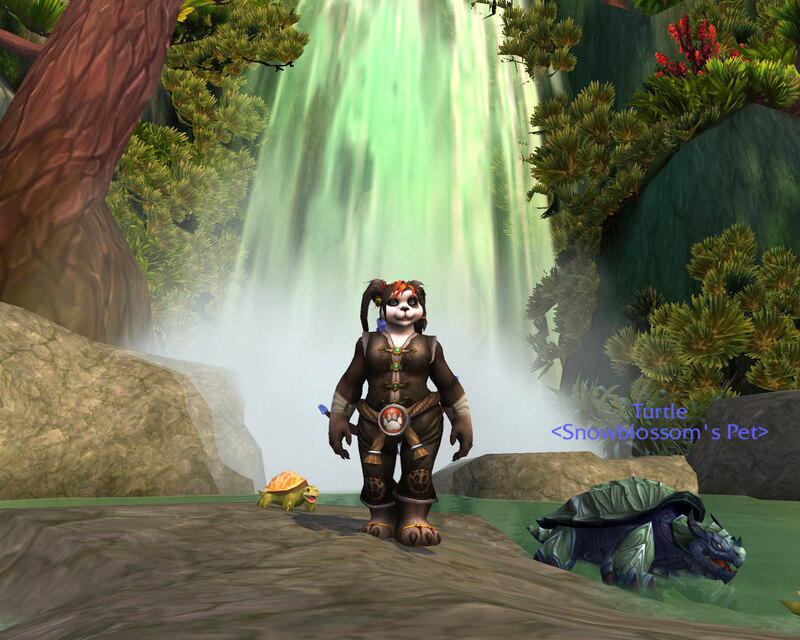 Make a Panda Hunter to replace the Panda Priest which I intend deleting. Make a list of all the pets I wish to tame. Now hopefully, at some point this week, the servers will actually let me on and I can start ticking things off.